In 1945, after the end of World War II, a boy met a girl at a party. The boy’s name was Charlie Rosell; the girl’s was Grace Sundbye. 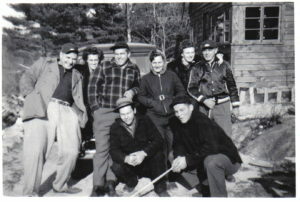 Although they did not know it then, in a few years’ time they would found one of the most beloved lakeside resorts in all of New Hampshire. When Charlie and Grace first met, Charlie had just returned from his tour of duty in Australia, where he built boats and barracks for the Army. Back in America, he lived on Nichols Avenue in Stratford, Connecticut. Grace lived in the Black Rock section of Bridgeport, Connecticut and worked at the American Chain Building for Schick as a file clerk. After a brief courtship, Charlie and Grace were married on April 24, 1946. They quickly began to plan moving further north to New Hampshire. By 1947, they had purchased a tract of land on Lake Winnipesaukee’s basin. Pursuing their dream, Charlie and Grace packed their 1929 Dodge Sedan in the summer of 1947 and headed north, hauling a trailer with their homemade boat, bedroom furniture, tent, carpentry tools, and an electric countertop. Charlie immediately set to work, having trees cut and milled, buying supplies, and beginning to build. In the spring that followed, Charlie and Grace continued to build, working to bring the rest of their dream to fruition. First, Charlie built a garage (which still stands today at the entrance to Sunset lodges) out of some fallen trees. Then, once the Basin melted, a grander project became possible—the construction of the guest cabins. Almost a decade prior in 1938, a severe hurricane had passed over New England and knocked down countless trees in and around the land that would become Sunset Lodges. With massive quantities of fallen timber going unharvested, the United States Government decided to intervene and salvage what it could. Forty-one million board feet of lumber were milled (a sawdust pile remains to this day at the north end of the property); the remaining trees were left to float or sink in the Basin. More than ten years later in 1949, Charlie, ever the ingenious Yankee, decided he would use these perfectly good logs for additional construction. With the help of Grace’s father, he devised a ramp to draw up the water-soaked logs using their 1929 Dodge. After getting the logs on shore, they were dried and hauled away to a mill where they were cut up in lengths. The year was full of happiness, as Grace and Charlie welcomed not only the construction of their first guest cabin, but also the birth of their son, Thomas Arn Rosell, born on July 27. The Sunset Lodges dream was slowly but surely becoming a reality. Now, nearly 50 years later, Sunset Lodges remains beloved by all its guests. After Charlie and Grace passed away (Charlie in 1998 at the age of 77 and Grace in 2003 at the age of 85), Sally ran Sunset in their stead. When Sally herself died on August 1, 2008, her son, Christopher (born September 30, 1978), passed ownership of Sunset over to Richard and Lorraine Sager. Rick has been vacationing at Sunset since 1962, when he was five years old; the Sagers are honored to carry on the tradition of Sunset Lodges. 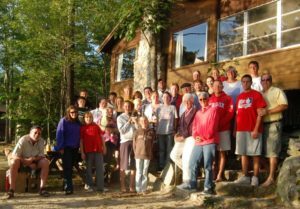 Rick and Lorraine Sager are dedicated to continuing and improving the legacy of Charlie and Grace, who built Sunset with the dream of sharing the lake’s beauty and serenity with others. This lakeside gem has been providing its guests with nearly six decades of family joy, and Rick and Lorraine are here to ensure that the future holds at least six decades more.